We’re back in Mumbai for a short while and I’m looking forward to doing some shopping and of course, eating. Ha ha! I’ve told you before that travel and eating go together for us. When we first got married and I moved here, Jose made sure that I sampled all the local delicacies in Mumbai. After all, I had introduced him to Andhra cuisine in Hyderabad and he had to return the favour! What I absolutely love about the traditional dishes in Mumbai are the simplicity of the preparation. If you’re visiting, you must try out these traditional dishes. I promise you, you’ll not be disappointed. Luckily for us we live in almost the centre of this metro so we have good access to the best restaurants in Mumbai – in town and in the suburbs! So I’ve had it all – the baida roti (egg roll), dhoklas (steamed savoury), the kheema pav (minced meat with pav bread), vegetable Kolhapuri (a spicy vegetable preparation), sabudana vada (a fried savoury snack made of sago) and kothambari vada (a fried savoury made of gram flour and coriander) and zhunka bhakar (a dryish gram flour preparation eaten with jowar bhakris (millet flat bread), thalipeeth (a traditional multigrain flat bread) and of course, poha ani cha (a flat rice savoury dish accompanied by sweet tea). When I was first introduced to misal pav, I knew I just had to try to make it at home. Unfortunately, none of the recipes I tried out came anywhere near the taste of what I had eaten. Also many of them were very complicated to follow. I asked Jose to take me back to this little restaurant in Churchgate and I tasted the dish again, and attempted to duplicate it at home. Luckily, I seem to have good tastebuds! My recipe tastes quite close to this, even if I say so myself. 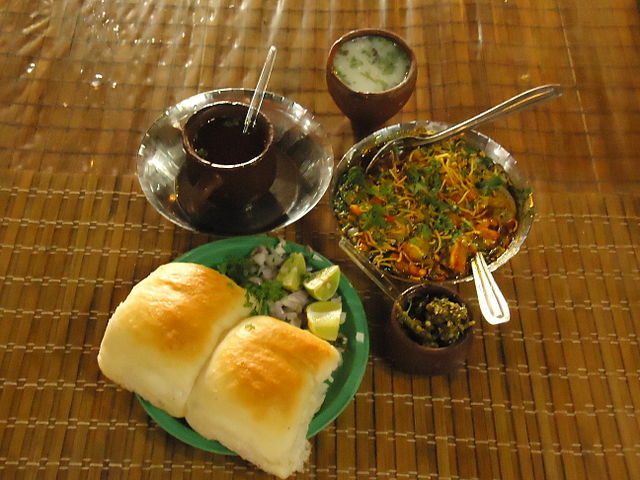 Now misal pav is a regular inclusion into our breakfast – it is tasty, filling and very healthy too. You’re welcome to a misal pav breakfast at our home! But if you can’t come over, I thought I’d share my recipe with you. 1 cup of a mixed lentils. I use a combination of matki (moath beans), chawli (black-eyed beans) and vatana (dried peas). You could also make this with sprouts. Pressure cook the beans the next morning in about 2 cups of water.I normally keep them for just about 3 mins after lowering. 2 small/ 1 large potato. I cook these whole with the beans. Do not drain. The liquid can be used for the gravy. Soak a small ball of seedless tamarind in a cup of water and extract a pulp. 1 teaspoon paprika (chilli) powder (we like it spicy). 3/4 teaspoon allspice (garam masala – I use Badshah’s Rajwadi garam masala for this. You may also use the traditional ‘goda’ masala). Heat 2 teaspoons of oil in a deep pan. Add the asafoetida, cumin powder, coriander powder, paprika, tumeric and allspice on at a time. Fry until masala turns dark brown (not burnt). Then add the beans, potato and tamarind pulp, a cup of water and simmer for about 5-7 mins. Add another cup of water to this. Add salt as required. This gravy dish is called usal. You can get these toppings ready while the usal is simmering. Put the hot usal into 4 – 6 bowls. Top with chopped onions, coriander leaves, farsan/sev. Place the pav, lemon quarters and extra onions and farsan on the table. I love how our traditional dishes are fun to make and healthy to eat! Love misal paav! I make it often! I’ve eaten misal pao just once in my life so far – while travelling from Goa to Mumbai – at a roadside dhaba! And I really loved it – thanks for this great recipe Corinne. You must try making it, Kimberly. It’s now a regular breakfast at our home! Every time I have Misal pav, I start sweating. Maybe its too pungent for me. Thanks for this recipe. I’ll try it though I’m not a misal fan. BTW while you are here do try the brun maska and mawa cakes at any Irani joint, the chop suey dosas on roadside stalls, the special Bombay sandwich and jalebi gathias from Swati! I can go on and on about the wonderful stuff you can get to eat because I follow my nose and go where my taste buds take me! Corinne,only you can simplify a traditional recipe so well ! Healthy too ! This looks awfully good and I think i’ll give it a go after my renovation is done!